This 4.3 inches phone has removable and replaceable 1620 mAh of Li-Ion battery. That's why in this post, we provide a tutorial on how to remove the battery or install the battery. But first because the battery's compartment has a cover, you must know how to remove it from 129.7 x 67.9 x 10.7 mm (its body dimension). Desire SV seems to be designed for anyone who love to have more than one mobile phone number. Yes, this device supports with dual SIM cards. It uses microSIM card type (may varied depend on your region and provider carrier). About this 2 SIM, we gonna elaborate later along with the tutorial how to use this dual sim and insert it. From the rear panel which the 8 Megapixel camera is located you can do a removing device of the HTC Desire SV. On the bottom side, you'll see an opening hole that you can gripped with your finger. Then by using your finger you can firmly grip the back cover and lift it up until the back cover is removed. Reversely, you can close the back cover back to its place (replace back) by aligning the cover with the back camera (make sure the hole of the camera aligns properly) then from top to bottom you can press it down. The final step should be the bottom cover in which it would locked properly with the opening cave. After yo open the cover, you'll notice that there are two parallel slots and one who cross the two slots. The parallel card slots are the dual-SIM card slots, and the other one is the microSD external memory card. You might also know that the battery somehow is already assembled. With the both SIM cards are facing down, you can insert it to both of the slots. Align the cards with the compartment slot the push the card until they reach slot's end. Follow the position of the cut edge of the card just like what shown on the top carved figure of each slot. 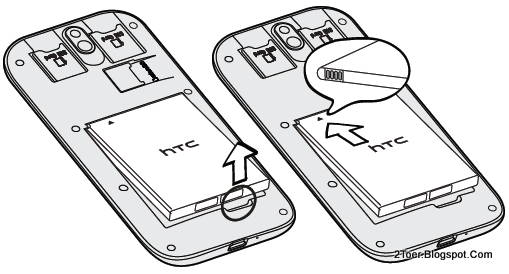 That how you can insert the dual sim Card of HTC Desire SV. To insert the microSD memory card to this Android ICS (Android Version 4.04) phone, just face down the gold-colored contact of the microSD card then slide it in into the memory card slot. To remove it just use you finger (you might need to use you fingernail too), then slide it out until it fully removed from its slot. For clear understanding about what we talk, just refer to the tutorial shown on the figure above. Sometime if your batter worn out, you need to replace with the new battery; or in case you wanna force to reboot the HTC Desire SV, you must do on removing and reattaching the battery you can do it by following these instruction. There is a battery removing cave / hole that would assist you to lift the battery up with your finger (use your thumb should be the best). Then pull it out and if the battery can be grab you can remove it with your hand. On the other hand, to assemble the battery, all you have to do is inserting back to battery compartment with the copper-contact is aligned with the battery compartment. See picture please. Here you go, the battery is ready to power up the Dual core 1GHz Cortex A5 processor and 768MB RAM with Qualcomm MSM8225 Snapdragon chipset of the HTC Desire SV along with its Android OS. Sometime your Super LCD2 Capacitive touchscreen on the 4.3 inches of this Desire were stop responding. The touch of your finger do not works on the touchscreen. Whenever this trouble occur too frequently, might be you need to fix it by doing Hard Reset on HTC Dsire SV. Here are the steps that you must do. If you are able to access the settings of thiss 131 grams phone, you can slide the notification panel (top side; down slide) > Tap Settings > Storage > Factory data reset > Reset phone > Erase everything. Otherwise you can do it by hardware buttons combination. Open the back cover casing just like we tutor you above, remove the battery, reinsert back after 3 - 5 seconds, replace back the cover the do this: Press and hold VOLUME DOWN > immediately press and hold the POWER > Three Android appear > Release all the buttons > Press Volume Down to select Factory Reset > Confirm with Power button > The Master Reset is Done. Remember to back the personal data before you do this Reset because this steps would delete the saved documents, games, applications, videos, photos, and other added materials. The phone will give the state to original factory settings (default).